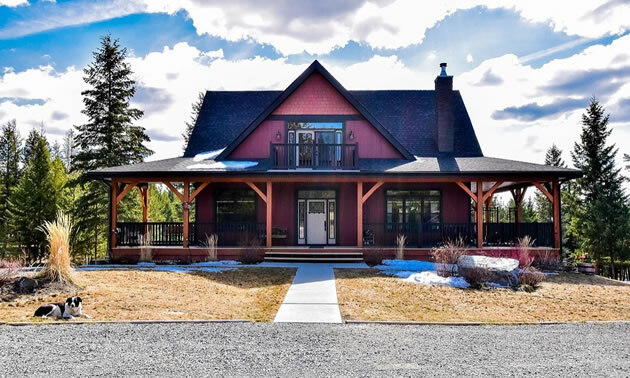 Innovative technology meets traditional craftsmanship in this 2012 custom built timber frame home on a beautiful and very private 5.73 acre lot. A horse lovers paradise in a one-of-a-kind setting. Quality built home using Insulated Concrete Forms (I.C.F.) on the basement & main floor walls, combined with radiant-heated floors (3 levels) creating an advanced building system that makes this "A Home with a Difference". There are 4 bedrooms, 3 bathrooms, 9 ft ceilings on 2 levels & 22 ft vaulted ceiling in the living/dining room. Accenting the living room is a Hearthstone wood stove & handcrafted wrought iron stair & loft railing by Paul Reimer architectural blacksmith. Dream kitchen with gas stove, hickory cabinets, marble countertops & large island. Main floor laundry, deck off master bedroom & corner Jacuzzi tub in upstairs bath. Full daylight walkout basement with 1 bedroom in-law suite with concrete covered patio and parking. Wrap around covered decks with natural gas bbq hookup overlooking beautifully landscaped private yard with garden shed, fire pit and large fenced garden area. Approx 2.5 fenced acres for horses, spacious hay shed/barn, covered horse trailer storage and large storage shed. A wrap around driveway for excellent trailer storage and concrete pad for fully insulated & heated 3 car 30 x 44 garage, with 4 piece washroom fully plumbed for in-floor hot water heat.